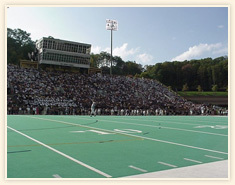 Not far from Banner Elk in Boone, North Carolina is Appalachian State University, a Time magazine 'College of the Year'. The university has gained a great deal of national attention lately as the Mountaineers have won three consecutive NCAA Division 1 FSC national championship titles in the past three years. Athletic accomplishments aside, ASU is rated as one of the finest institutions of higher learning in the nation and enjoys a well earned reputation for providing outstanding academic programs. ASU has garnered high praise from a number of authoritative sources such as Consumer Digest magazine's listing of the top 50 best values for public colleges and universities as well as Kiplinger's Personal Finance magazine's 100 Best Values in Public Colleges. Being located in one of the South's premier tourist and outdoor recreation destinations is a huge selling point for prospective students to ASU. The school is located in downtown Boone, NC and has an enrollment of just under 16,000 students, all of whom benefit from a student to faculty ratio of 17:1, one of the highest in the nation. Few schools in the nation can offer such a wide range of outdoor activities. The Blue Ridge Parkway, Pisgah National Forest, Grandfather Mountain, four ski resorts (Appalachian, Hawksnest, Beech Mountain and Sugar Mountain), numerous golf courses and several whitewater rivers literally surround the campus. Each of these is no more than a thirty minute drive from the ASU campus. The 1,300 acre campus including a 410 acre main campus features 19 academic buildings, a 210,000 square foot library, 4 dining facilities, 11 recreational and athletic facilities including Kidd Brewer stadium, home of the Mountaineers football team. Appalachian State University draws its student body from all around the nation; it is quite a testament to the school as well as the allure and beauty of the area that many of these students choose to live here long after they have finished their studies. Lees-McRae, located in Banner Elk NC, is a private four-year liberal arts college offering a smaller alternative to its larger neighbor ASU. The college has seven academic divisions, including Business and Information Systems, Social Sciences, Humanities, Performing Arts, and Science and Mathematics. The Lees-McRae Bobcats compete in NCAA Division II play in Conference Carolinas, and are National Champions in Division I for cycling. With an enrollment of around 900, students have the advantage of being a name, not a number at Lees-McRae. The college offers more than 25 majors leading to both Bachelor of Arts and Bachelor of Science degrees. The Honors Program at Lees-McRae College offers a challenging and supportive learning environment for highly motivated and academically gifted students. The Honors faculty is noted for their excellence in teaching and uses a sophisticated approach in the classroom. The beauty of the Appalachian Mountains is reflected on Lees-McRae's 400 acre campus, with 30 buildings most of which are constructed of native river rock. Students who come here are usually very outdoor-oriented, taking advantage of the beautiful mountains they call home.